You have surely heard of lawn aeration, but you might not fully understand the point of it. What good does poking holes in the dirt really do? 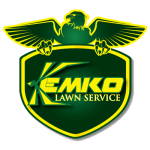 Kemko Lawn & Shrub performs lawn aeration for clients all over Atlanta, and we have been recommending this service to our customers for over 30 years. It’s a big part of the reason why our customers consistently have lush, green lawns they can be proud of. Keep reading to learn exactly what lawn aeration can really do for your lawn. Lawn aeration is simply a process of punching small holes into the soil. This alleviates soil compaction, and allows water, nutrients, and air to penetrate down to the grass roots more easily. Delivering these vital components to roots faster helps the grass plants grow quicker, stronger, and more efficiently. It means you will waste less water and fertilizer, which can make a big difference in your checkbook. Aerators come in either spike or plug form. Spike aerators are simply sharp metal tines that poke holes into the soil. Plugs actually pull a bit of soil out of the ground and deposit it elsewhere on the lawn. It’s sort of like taking tiny core samples out of your dirt, which is why this method is called core aeration. Core aeration is more effective than spikes. For best results, look for an aerator that pulls plugs 2-3 inches deep, and about 2-3 inches apart. For large lawns, homeowners can perform aeration using an aerator trailer that’s pulled behind a riding mower or ATV. Some of these aerators also have a seed spreader built in, making them a much more versatile tool. 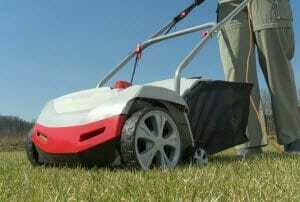 There are also gas-powered models that look and work a lot like a push mower. If you have a smaller patch of grass, a step-on aerator tool, or aerator sandals that strap onto your shoes would work great. When Should You Perform Lawn Aeration? Different types of grasses have their own aeration requirements, so it’s important to know what kind of turf you have before you get started. Homeowners should aerate cool season grass, such as fescue, in the early spring or fall. Warm season grasses, including Bermuda or Zoysia, should be aerated in late spring. Either way, it’s best to aerate a wet lawn. Try to tackle this project the day after a good rainstorm, or plan to give the grass a good watering the day before. For the very best results, it’s always a good idea to seek an expert opinion. Kemko Lawn & Shrub knows Atlanta’s turf types inside and out. Our experienced, licensed, and insured technicians can help you create a lawn care schedule that will give you a greener, healthier lawn than you’ve ever had before. Have questions about lawn aeration? Click to see if it’s on our FAQ list.